The Complete Guide to Special Education is now approved for 0.6 ASHA CEUs! 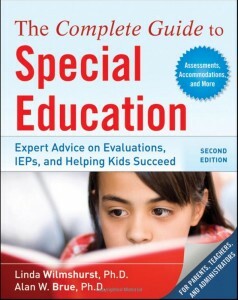 This CE test is based on the book “The Complete Guide to Special Education, 2nd Edition” (2010, 372 pages) and should appeal to a wide variety of professionals, including: clinical psychologists, school psychologists, social workers, professional counselors, speech-language pathologists, as well as educators and school administrators. The course explores the special education process, from testing and diagnosis to IEP meetings and advocating for children with special needs. The stages of identification, assessment, diagnosis, eligibility, and intervention are discussed step by step to help readers better understand the legal rights of children with special needs and the roles of the many professionals who make up the child’s educational team. This course provides clear and concise information about the special education process; addresses Response-to-Intervention (RTI), a new approach to identifying students with a learning disability. Special topics such as executive functioning, behavior management and discipline are discussed and supported with practical professional suggestions. Course #60-92 | 45 posttest questions | This is a test only course (book not included). The book can be purchased from Amazon or some other source. This entry was posted in CE Courses, Speech-Language Pathology CEUs and tagged ASHA, CE, CEUs, continuing education, Education, Educational, Individualized Education Program, Learning disability, Online Courses, Professional, Professional Development Resources, SLP, SLPs, Special education, Student by Gina Gunderson. Bookmark the permalink.